Without a doubt, my slow cooker (aka Crock-pot) has become one of the most used appliances in my kitchen. It’s such a helper when I need to multi-task. I wish I had discovered the magic of a slow cooker back when I was raising my children. Make a note, young busy moms and dads! I often use it to make traditional Korean dishes for my elderly parents and parents-in-law who are living nearby. On weekends, I just throw a few things in the slow cooker early in the morning, and this frees up time to do other things I need to do, such as testing and photographing recipes for the blog. By the time I’m done with my busy schedule, a succulent, fork-tender meat dish is ready to be delivered. They all love it, especially my mother-in-law who’s never been a meat lover before. She’s been recovering from some major health issues and trying hard to eat well to regain strength. I’m glad to be helpful in a small way. 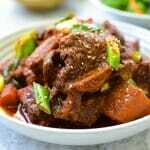 This recipe is the slow-cooker adaptation of my recipe for traditional galbijjim, hence the same great authentic flavor. When I use my slow cooker, I like to minimize the prep work as much as possible. So, there’s no grating, mincing, par-boiling or browning in this recipe. You can do the prep work the night before. Start the slow cooker in the morning before heading out, and come home to a delicious meal waiting for you. As I mentioned in my previous galbijjim post, traditional galbijjim does not involve initial browning of the ribs. But, it’s totally up to you if you want to take the time to sear the ribs to add that rich browned meat flavor. I’ve tried both ways with the slow cooker, and the results are equally delicious in slightly different ways. This recipe is also excellent for other cuts of beef (chuck roast, brisket, flank steak, etc. ), pork ribs or roast, and chicken. Simply cut the meat into a few large pieces. The ingredients in this recipe generate a lot of liquid, so no additional broth or water is necessary. The result is fall off the bone tender meat in a rich, slightly sweet and savory sauce! Slow-cooker adaptation of my recipe for traditional galbijjim, hence the same great authentic flavor! Trim off any excess fat. 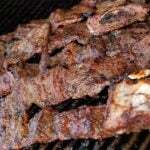 Rinse the ribs and let them sit in cold water for about 30 minutes to draw out excess blood. Drain well or pat dry with paper towels. Prepare the vegetables and pear by cutting into large chunks (about 1-1/2-inch pieces). 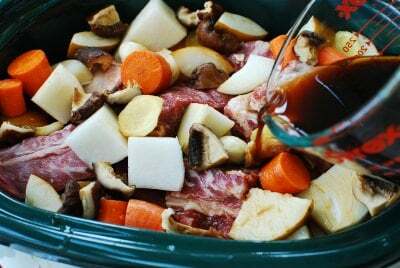 Place the ribs and vegetables and pear in the slow cooker. Mix together the soy sauce, rice wine, honey (or sugar) and pepper, and pour over the ribs. Toss everything to coat with the sauce. Cover, and cook for 6 to 7 hours on high or 9 to 10 hours on low. Flip the ribs over midway through the process if you’re home. (Adjust the cooking time, depending on how tender you want your ribs to be.) Stir in the scallions and sesame oil. Thank you, Nammi! Happy crock pot cooking! Hyosun – I LOVED your original Galbijjim recipe, but it was very time consuming. Will definitely try this one. Please post more crock pot versions of your recipes. Thank you! Thank you, Michelle! This will definitely help you with the time issue. I have a few more crock pot recipes, so stay tuned! Hi Hyosun! I’m a Korean American mom but I am not fluent in Korean and my mother isn’t fluent in English. She’s a wonderful cook but I am barely passable and I don’t cook Korean food at all, so I love your site! I tried to find rice wine at the store today but could only find rice wine vinegar. What brand of rice wine do you recommend? I’m going to try this recipe but prob. half it as it’s my “first attempt…” 🙂 Thx so much for this site. Hi Baxterita – Once you really get into Korean cooking, you’d be surprised to find out how much you’ve learned from your mom just by watching her cooking and eating her food. All my best wishes for your Korean cooking! I usually buy what’s on sale, but most Korean/Asian markets carry both Korean and Japanese brands. Mirin or Koreans call Mirim (미림) – sweetened rice wine – is okay too. Hope this helps. Let me know if you have further questions. Thank you so much for using my recipes! Great idea of using slow cooker! Your galbi jjim looks divine, Hyosun! Perfect meal for the cold season. Hope you are doing well. Your parents and in-law parents must be so proud of you. Thank you, Holly! Great to see you again. Is there anything you can use to substitute for the rice wine? I am planning on making this tomorrow. Hopefully it comes out as good as yours looks. Thanks for posting! Use any cooking wine, or simply omit it. Let me know how it turns out for you. Thanks. sherry and rice wine (Mirin) have the same flavor profile. They are interchangeable. Thank you so much, Ames! Great to hear the recipe works with a pressure cooker as well. I’m sure some of my readers want to know that. How long did it take with a pressure cooker? Thanks so much for posting this. I’ve been searching for a galbijjim recipe for the crockpot. Also, thank you so much for your mu guk recipe. It tasted almost identical to my mom’s!! You’re welcome, Soo! It’s my great pleasure. Hope you like it. Also, I’m happy to hear my mu guk is almost like your mom. Thanks for letting me know! Happy cooking! Hi, do you think it would work to make this with boneless short ribs? The Costco near me sells only boneless short ribs. Thanks! Certainly! I’ve done it with boneless short ribs I bought from Wegman. Please let me know how yours turn out. Thanks for using my recipe! How many people will the serve? Lisa – Sorry for the late reply. It really depends, how much each person would eat, but I’d say 4 to 6 people. Thanks! Hope it turned out well and you and your family enjoyed it. I’m making your recipe now and looking forward eating it. Question, is that liquid for crock pot or should I add beef broth or water ? The recipe (slow cooking) generates enough liquid you can use as sauce, so you don’t need any additional broth or water. Please come back and let me know how you liked it. Thanks for trying it out! Enjoy! I am planning on making this today but realized my meat is only about 2 lb. should i put less soy sauce or add little water like the person who made it on pressure cooker? 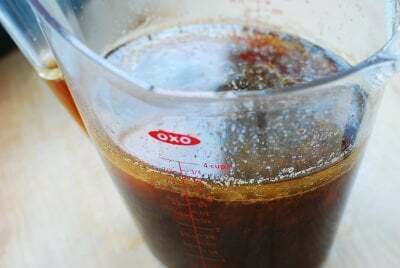 Yes, just use a little less soy sauce, maybe 1/3 cup instead of 1/2 cup, and sugar or honey. If you’re using a slow cooker you don’t need to add water. Hope this helps. Thanks! We made this dish using less beef (about 2.6 lbs) and more carrots and turnip. The slow cooker was pretty packed — and I was a bit worried about the marinade not covering the beef but it all worked out in the end. It was an incredible dish! Thank you so much for posting this. This dish is definitely going to be a staple in our home. Can’t wait to see what other slow cooker recipes you post next. How does the taste for this differ from the original galbijjim recipe? This recipe is the slow-cooker adaptation of my recipe for traditional galbijjim, hence the same great authentic flavor. Hope you try it. Made this yesterday and it turned out great! Will try with potatoes next time. Great! Thanks for letting me know. Potatoes will work as well. I just made this today and had to thank you for this amazing recipe!! Aww that’s great to hear! Hope you find more recipes you like from my blog. Thanks for coming by and leaving me the feedback! Cheers! you add the seasame oil and scallions half way or at the end? At the end. Hope it turns out delicious for you. Thanks for using my recipe! Well done, well done! This is what my family told me, so I’m telling you…well done! This recipe was excellent. The ribs were falling off the bone tender. Well done, Valerie! Glad to hear your family enjoyed it. I made it with pork ribs today for my mother-in-law. She always loves it too. Thanks for coming by! I will try this soon! How many servings does 3-4 lbs make? If possible, serving size information for your recipes would be helpful! thank you! I’d say about 4 – 5 servings. That’s only my guess, not based on standard serving size for meat. I’ll try, but the number of servings in a recipe really depends on your family portion sizes and what other dishes you serve with. Thank you! This was really easy and super delicious! Even my picky eaters liked it. Thank you for a great busy mom recipe. Sure! You can definitely do that. I’m korean and grew up having this made by my mom on stovetop/dutch oven. This slow cook recipe is easy and tastes just like my moms! Made it a month ago using 2.5 lbs of meat, all other steps were followed exactly and it was enough for my boyfriend and I to have dinner and then leftovers the next night. Added potatoes and omitted the optional items. We’re making it again tonight using 3lbs (the amount for us just depends on whats already weighed/packed at the korean grocery). Thanks for the great slow cooker recipe! Awesome! I’m very happy to hear it tastes just like your mom’s. Thanks for taking the time to let me know! I tried to get short ribs at my local grocery store, but they look nothing like what I got in Korea, so I didn’t buy any. What do I tell the butcher so that I get the right thing? Ask for tonggalbi or jjim galbi. Korean butchers will know if you tell them you’re making galbijjim. Hope you find good ribs. What I have at home is a die cast casserole Dutch oven, not a slow cooker or crockpot. Do I need to adjust cooking time and method? Hi Jan – I haven’t used a dutch oven for galbi jjim, so I can’t tell you exactly how long it will take. Sorry about that. My guess is it should take much less than using a slow cooker. Yes, you will need to double the recipe for 8 pounds. If you end up using the dutch oven, let me know how it turned out. Thanks. Hi, I have some beef chuck boneless ribs from Costco…I’m looking forward to making this in the crockpot but want to make sure the meat doesn’t overcook…what can I do to ensure that it comes out tender, even if boneless??? Thanks so much!!! Hi Kate – I’ve tried the recipe with boneless ribs before. It turned out tender. Long slow cooking will help ensure that, so I don’t think you need to do anything else. Try it and let me know. Thanks! Hi, I was just wondering if I use potatoes when should I put them in? I know they break down and gets all mushy too quickly. Thank you in advance! PS: tried your other slow cooker recipes and they came out GREAT!! Thank you! You can add potatoes. Just make sure the potatoes are cut in large chunks. They will be fine. I’m glad to hear you tried my other recipes and they came out great. Thanks! 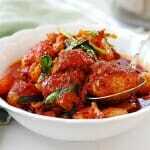 The slow cooker version of Kalbijim is wonderful and convenient. I love this recipe but I noticed it is not quite the same as the conventional method. Is there a reason why the chestnuts and dates were excluded? No there’s no particular reason. For the slow cooker version, I just omitted them for simplicity. Thanks! I don’t think sesame oil would do that, unless it was a bad one and you used it a lot. Did you use a lot of ginger? I can’t think of anything else that would make the dish bitter. Let me know if you think of anything else. Keep trying. You will get there! I am planning on making this today. Can I use 1.5 by 1.5 inch pieces of boneless short rib? Thank u for this recipe! Yes you can. It may take less time though. Love your simple and delicious way of cooking. Thank you! 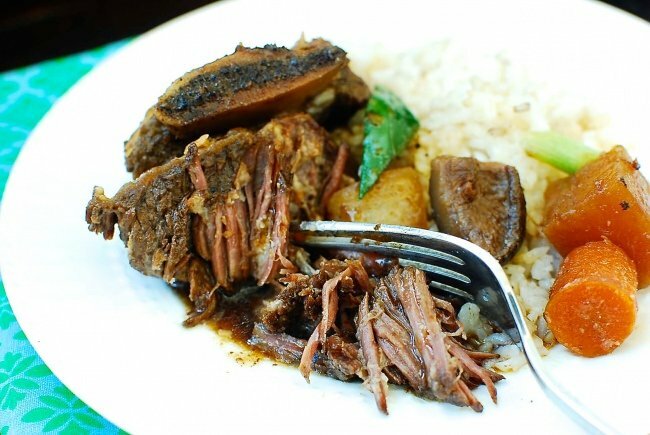 I love the concept of slow-cooker cooking but I do not love tasting greasiness, especially it involves cut of meat that has certain amount of fat (which is important for flavor), such as beef short-ribs. I would love to try this recipe if I know how NOT to make this recipe, greasy. Does fat-separater actually work? I’ve used it once during one Thanksgiving for the turkey but I didn’t think it was effective at all. Instead, I’ve wasted a good amount of ‘good’ juice. Of course, placing the sauce in the fridge involves an over-night process which defeats the purpose of slow-cooker cooking. To me, almost all slow-cooker cooking look good in picture/concept but for my Korean tastebuds, they are just a bit too greasy. Should I just stick with the original poached beef short rib recipe? Thank you for putting together such a wonderful blog! I have made this recipe two times now in my slow cooker and both times it has turned out wonderful! For many years I lived in Los Angeles and had access to so much wonderful Korean restaurants there, but now I live in Las Vegas and the options are much more limited so I am so happy to find your blog so i can try to re-create many of my favorite Korean dishes at home! Keep up the good work! aww thank you for such kind words, Morgan! I know what you mean. LA is the best city in America for Korean food. I am glad my blod is helping you with re-creating your favorite Korean food at home. Happy Korean cooking! I’ve always wanted to try this recipie,I’m going to try it tomorrow.I’m so glad that I can do it while I’m at work,wish me luck. okay good luck! it will be good. Galbijiim:tried this recipies today,awesome so tasty,this will be added to my recipies book.I will try the chicken recipies next,I’ll let you know,oh can I use boneless chicken breast,as a substitute,for chicken peices? So I tried the recipe today and the taste was mind-blowing! I didn’t know Korean cooking could be so easy and fun. This is the first Korean dish I ever made and you made it very enjoyable! The meat was so tender, the broth rich and layered with sweet and salty notes, and the fresh green onions added a nice texture on top of rice. That’s awesome, Daniel! 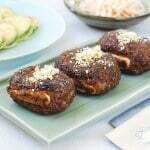 I am so happy to hear you found Korean cooking easy and fun through my recipe. Happy Korean cooking! Wonderful recipe. Browned pork ribs in Dutch Oven took one hour and a half. Fall off the bone meat. Thank you for sharing. Love ur site. Fed family of 4 adults and 2 children. And maybe 2 more svgs leftover. Thank you! I am delighted to hear that. Yes, this is an easy way to feed a big family. Thank you for sharing this great recipe! I’m actually looking into buying my first slow cooker (or pressure cooker) as it seems like a great way to cook great meals while working full-time. Would you say that a slow cooker or pressure cooker is better for Korean food if you could only choose one? We already have a pressure cooker for rice, but since we eat rice most days, I’d prefer to have another one if a pressure cooker is more useful. I like my slow cooker. You can use your pressure cooker for rice as a pressure cooker for other things. I’m so glad I found your recipe for galbijim. This is one of my husband’s favorite dishes and with the cold weather approaching, I can’t think of a better meal. 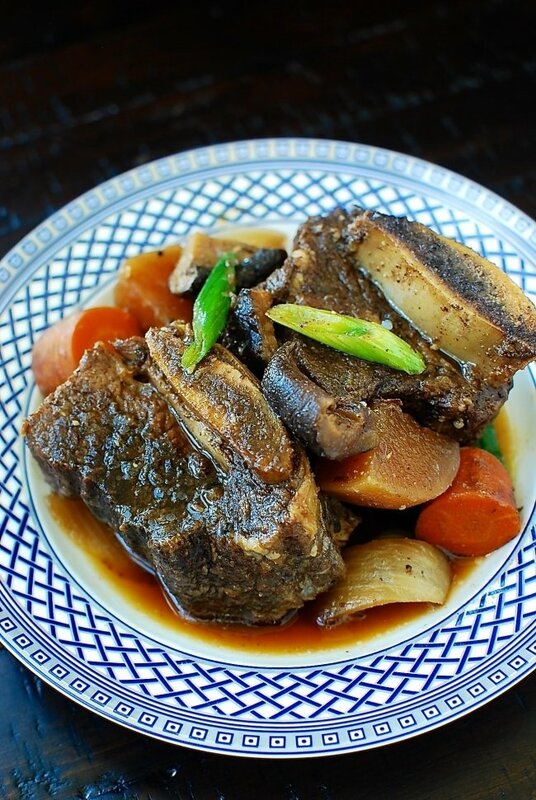 How many pounds of boneless short ribs would I use for this recipe? 4-5 pounds? Thank you for all the great recipes!! So sorry for the late reply! 3 to 4 pounds will be good. Enjoy! I’m so excited to try this recipe for my friends tomorrow! Thank you for sharing it! Just a few questions: First, is it okay to use fresh shiitake mushrooms? Second, do the garlic cloves go in whole or sliced? Thank you! Yes you can use shiitake mushrooms, and you don’t need to slice the garlic. Thank you so much for this recipe! I’ll definitely be trying it soon. Just have a quick question. Would this recipe turn out ok if frozen? You should defrost the ribs first, or it would take much longer than the time specified in the recipe. Thanks for this recipe. I like how easy it was to make it and the meat and vegetables all cooked well, but I found that the usual sweetness of the sauce didn’t permeate the meat as well as I would’ve liked. I’m wondering if it’s because of the cut of meat. I also added some oxtail and that was actually perfect. I supplemented by taking out all the meat and vegetables, separating the fat, then reducing the sauce in a pan with more sugar, which seemed to help the overall dish. Thanks for a good base. I’m excited to try out your other recipes like the radish soup. 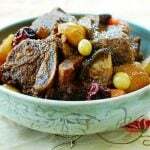 I was in a frenzie,trying to remember the website,where I got the delicious recipie for,slow cooker,Korean shortribs.Korean bapsang,thank you for this recipie,I’m going to make it tomorrow,I tried it last year,it was a huge hit,with the family. Ann – I am so glad you were able to fine it! Enjoy! I tried this last week and it came out so good. Can i do this with Oxtail too? Yes you can! Adjust the time if you have to. Enjoy! Hi! I am in love with your recipes, including this one! Made it for the first time yesterday and we loved the flavours. Like another commenter, I also used sauvignon blanc, which is what I had on hand. My only question – my vegetables turned completely dark brown (i.e. the same deep colour as the soy sauce). They did not look like yours. Do you have any ideas what I did wrong? Do you think I could have overcooked it? Hi there, do you think I can make this using pressure cooker instead of slow cooker? Thank you ? Sure you can. You will need to add some liquid, depending on how much ribs you use. 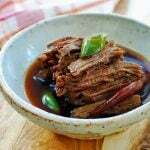 There is a comment above where a reader shared the experience making this recipe in a pressure cooker adding a cup of water for one pound of meat. Let us know how it turns out for you. Which is better tasting, the slow cooker or boiling the traditional way? Thank you! 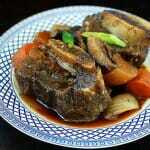 The taste is very similar, but the slow cooker version will be more tender. I loved that I didn’t have to sear the beef first! It was delicious. I’ve also enjoyed your Dak Gomtang and Seolleongtang. It’s a new way of cooking for me. I am newly married Korean girl =) also expecting to have a child very soon. Trying to cook more Korean food these days. Thanks for your recipe! It was so easy to make!! Great! Hope you find many more recipes to try and enjoy with your new family! Thank you for sharing your wonderful recipes! 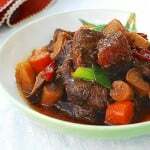 I’ve tried making the Korean Short Ribs on the stove-top, and my family loved it. I will try this recipe next to save on effort, but I was wondering if it could also be adapted to an Instant Pot in order to cut back on the cooking time? 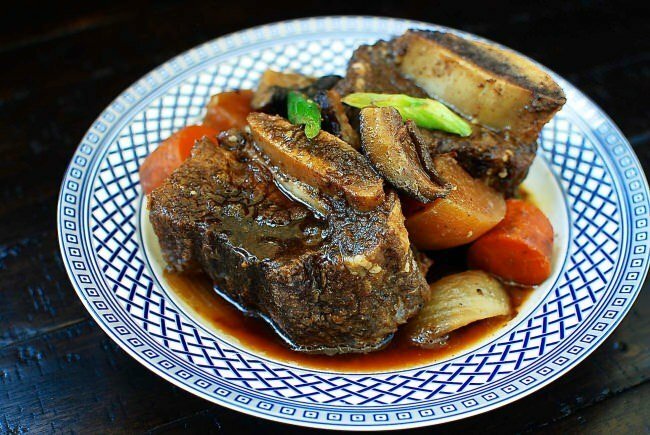 I know you have a similar recipe for the Instant Pot using oxtail, but could short ribs be used instead with the same marinade? Thank you! 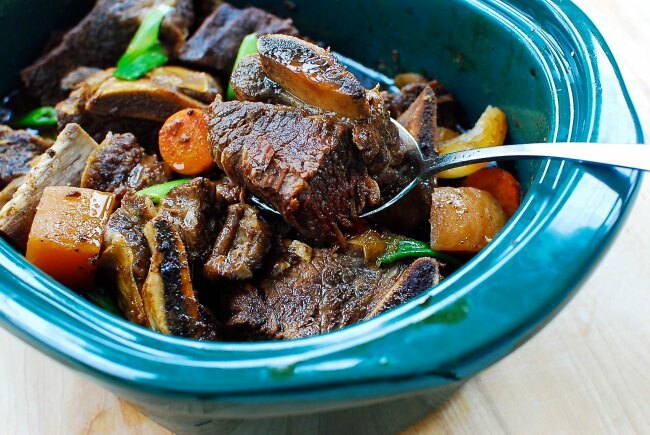 Yes, you can certainly use the same instant pot recipe for short ribs. Enjoy! I made this for last night’s dinner and it was delicious after a very long day at work. I’m Chinese and regularly dismal at cooking in general. My husband is Korean and I got a thumbs up with this one! I found the flavors were very well balanced. I’m looking forward to trying more recipes!!! I’m not Korean, but I love your recipes. I wished you lived nearby so we could taste each other’s cooking. Thanks for sharing. Delighted to hear that! You can also use white wine as a substitute for rice wine. Hope you enjoy my other slow cooker recipes as much! Hello – this looks amazing and I’d love to prepare it for a dinner party. If I double the recipe, how should I adjust the cooking time? Thanks! It really depends on your slow cooker. Shouldn’t be that much longer. Just flip the ribs once or twice half way through and check the doneness somewhere around 4 to 6 hours. Have you thought about cooking in two batches ahead of time and reheat? I have made this recipe before by using my oven instead of the crock pot. It came out delicious! Do you think searing the meat first will make the resulting sauce even better? I am afraid to try it since I’ve had such wonderful results without searing. Do you usually sear if you have the time? I’m planning to make a large pot for Thanksgiving for my Korean In-Laws. Thank you for sharing a wonderful recipe. Yeah mine is 6 quart. I think it should be okay up to 3 pounds (or a little less) of short ribs, but no more. Let me know how it turns out. I did end up adjusting the sauce after separating the fat, bc of all the liquid in the veggies, it created a lot of sauce. I reduced it by boiling it down a bit and it still needed some help, so I put 3T of rice vinegar, 1T of sugar, and 1 teaspoon of black pepper. I will definitely be making this again. Thanks for posting!